There’s a lot of pressure on me to be in two places at once these days, so I was happy to see Google file and trivial and obvious “patent” on how to help busy executives achieve this using new (well, pretty old, actually) technology by gluing an LCD display and a wireless web cam to a drone. Google is hoping to patent a small videoconferencing “telepresence” drone for collaborating with colleagues from remote locations, according to an application that was made public today. The drone is designed to fly indoors and move from room to room. From Pocket: Working from home? Google wants to create a drone to go to meetings for you. Not only is this more trivial than it appears at first glance, it already exists in essence. 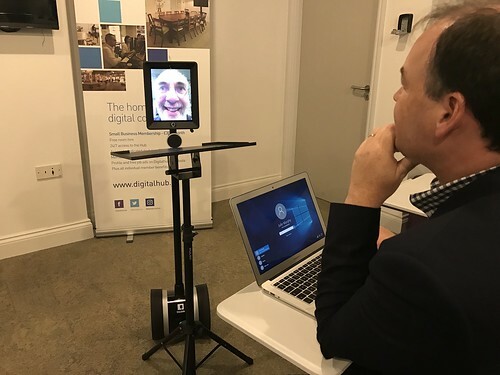 Here, for example, is photographic proof of me annoying Tony Moretta, the CEO of Digital Jersey, in precisely this fashion by sending a meeting bot (an iPad glued to a Segway, basically) to talk to him while I sat comfortably with my iPhone in a distant location (well, the room next door to be honest, but you get the point). As Tony himself pointed out, this implementation suffers from the Dalek Deficiency, in that he can escape my dreary lecture about the difference between a digital currency and a cryptocurrency by heading downstairs to the gents. Fair point. But with the google-powered flying Dave-o-Drone there will be no escape (unless they’ve fixed the door on the gents, of course). “There’s no transaction type for doing that on the network”. That’s should take care of most eventualities. It’s hard enough to tell whether people are actually listening on a conference call or not so how we’ll be able to tell whether it’s a bot or a person sitting in by drone will be a whole new ball game. I can forsee a time when we’re going to need a new version of the Turing test specifically for management meetings otherwise one day I will undoubtedly end up like this guy who is playing World of Warcraft when he realises that he is the only actual human playing the game and all of the other players are bots. Pay attention because one day this will happen in a meeting about EMV Next Generation or something. My only goal left in life is to become the Leroy Jenkins of Consultants. And, I have to say, whoever comes up with a working HonorBuddy variant for business meetings will become rich beyond the dreams of avarice. I’ve said it before, and I’ll say it again, IS_A_PERSON will be the most valuable credential off all in the not too distant future.